Rivers United's Israel Daniel in jersey number 16. 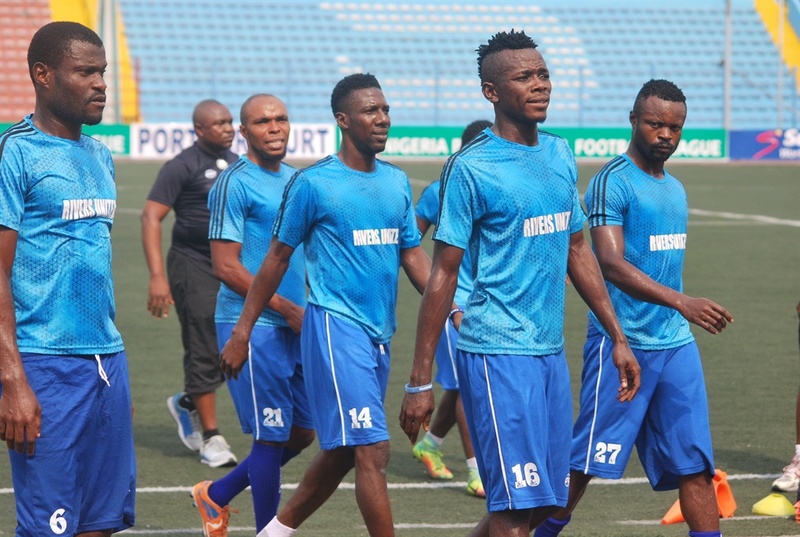 There was to be no ‘late heartbreak’ as Rivers United held on to record a goalless draw against ABS FC as the Nigeria Professional Football League on Match Day 29. Abiodun Akande was the star of the show and the most outstanding Rivers United player at the Illorin Township Stadium. The young goalkeeper produced a string of brilliant saves to keep Rivers United in the game. ABS’ forwards were wasteful as the Port Harcourt club rode their luck for most parts to claim an important point away from home. Mohammed Mohammed was the first ABS forward to spurn a good opening in the sixth minute when his shot was expertly turned away from goal by Akande before Ossy Eugene headed over just seconds later. Eguene looked inspired and had two cracks at the United goal in a space of a minute just before the quarter hour mark but on both occasions, Akande looked sharp and alert. In the 26th minute, the hosts missed another chance to take what would have represented a deserved lead when Ossy shot into the side netting from a tight angle. If the first half was breathless, the second was a frenetic affair as the home side stepped on the accelerator in search of a goal. ABS looked menacing and almost opened scored on the hour mark but Gata inexplicably shot wide from four yards with a gaping goal to aim at. It was an extraordinary miss which left the home faithful stunned and wondering what their forwards needed to score a goal. United’s best chance arrived in the 71st minute and it fell to Ovoke who raced 20 metres before having his firmly-struck effort kept out impressively by Boje. Rivers United thus move up one place on the log to 13th with 37 points from 27 matches while ABS dropped one place to 18th.